Self-Paced Phonics: A Text for Educators,Fifth Edition, is the ideal resource for pre-service and in-service teachers to get practical instruction that helps them develop a sound understanding of both the content and pedagogy of phonics. 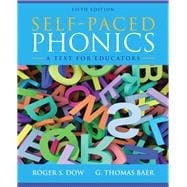 More than a tutorial in phonics, this self-regulating, self-monitoring resource covers both the content and pedagogy of phonics. Designed for use with a minimum of instruction, at the reader's own pace, the book is particularly teacher-friendly and immediately applicable to Web-based instructional models. Dr. Roger S. Dow is Director of the Reading Clinic and the Graduate Reading Program at Frostburg State University where he has taught for over 30 years. Prior to coming to Frostburg, Dr. Dow received his Ph.D. from The Ohio State University in reading and in psychology. He is an active member of the International Reading Association, with varied interests in linguistics and foreign languages as they relate to English. Dr. G. Thomas Baer is Emeritus Professor in the Department of Curriculum and Instruction at Illinois State University where he has taught for over 35 years. During his tenure, he has served as Elementary Education Coordinator, Department Chair, and instructor of elementary education courses specializing in reading instruction.